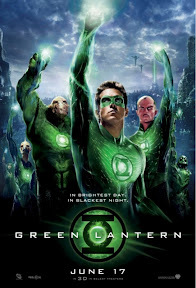 Home » green lantern , movie , review » Review of GREEN LANTERN: A mis-focused but fun movie! Review of GREEN LANTERN: A mis-focused but fun movie! Maybe I should disclaimer this by admitting that before going to see the movie, that I bought a Kilowog action figure just so I could have a Green Lantern power ring to wear while watching this flick. Well, that and to also have an action figure of Kilowog to pose on my desk, 'cuz he's my favorite member of the Green Lantern Corps. But I don't think that would be enough to subjectively color my perception of this movie when I say that I for one enjoyed the heck out of Green Lantern: the live-action adaptation of one of the most classic and revered superheroes in the DC Comics stable, which opens today. But I would also have to admit that this movie is far from perfect, or what it should be at a minimum. ...because we get Earth too dang much in this movie about Green Lantern. That's my biggest beef with this film. And it's sadly ironic: that for a story about choosing to be fearless, director Martin Campbell (who also directed Casino Royale a few years ago for the James Bond franchise) and his crew were afraid to let their baby take off and soar out into the larger universe where Green Lantern belongs. Ryan Reynolds as Hal Jordan, the human entrusted with the Green Lantern ring by the dying Abin Sur (Temuera Morrison, perhaps best known for playing Jango Fett and his zillions of clones in the Star Wars prequels) pulls off the role admirably, if also with a touch of clunkiness. The thing about Jordan's fear after the freak accidental death of his father, resonated with me with all the grace of a rusted cowbell. It was definitely something that could have benefitted from some rewrite and better editing (or being excised completely). Come to think of it, quite a bit of this film could have been edited away and it would have felt much slicker. I also liked Blake Lively as Jordan's girl/boss Carol Ferris. Tim Robbins also appears as a United States senator and Angela Bassett plays Amanda Waller (a DC Comics character and I'm wondering if Waller's turning up here is helping to set things up for the Justice League movie I'm hearing whispers about, much as Samuel L. Jackson's Nick Fury has been crashing almost all the Marvel movies of late). ...but when we do get pure-D Corps, the movie is an absolute hoot to behold. Michael Clarke Duncan is firing on all cylinders as Kilowog, the Green Lanterns' drill instructor. And for Sinestro, I really can't see any better than Mark Strong as the Corps' respected warrior, soon to become worst enemy. That doesn't happen in this film, but the setup is there (stick around during the credits). I'm looking forward to seeing Sinestro going full-tilt against the Guardians in the sequel (which, based on this film I do believe is merited). The special effects in Green Lantern are CGI intensive, and at times a bit cartoony... but given that this is a Green Lantern movie, I can forgive that and even say that it's about what I expected. James Newton Howard turns in a fine score. Conceptually, the scale of this film is vast. It's just not exploited to the fullest hilt. As I said, Thor made it work and there's no reason why it can't in a Green Lantern movie. Maybe in the follow-up we'll see Hal Jordan hanging around on Oa more and on Earth less (and speaking of Oa, I thought the Guardians were handled magnificently: elder beyond reason and yet a vital and breathing component of the Green Lanterns' realm). Green Lantern isn't the best superhero movie that I've seen, and it's somewhat frustrating that it's not the film that it could and should have been. But neither is it the train wreck or the bomb that I'm seeing too many other critics panning it as. I went in to see it braced for anything. Coming out, I realized that it is what it is: a fun summer popcorn flick. I won't say that I'm gonna give it my highest recommendation, but I will say that Green Lantern is worth considering plunking down some coin at the box office to see.